I am bit behind the curve on this one, but I recently got around to reading the latest articles published in the UPA’s Journal of Usability Studies. “Just as formative usability test results allow us to iterate on the design of a product, now the Agile team’s responsiveness to contextual inquiry results allows us to iterate on the requirements for a product. The total size of the description/specification of two key UI widgets were 1,215 and 735 words! The full article can be found in the May edition of the Journal of Usability Studies. Jeff Veen’s recent posting, Which international sporting event logo is the worst?, reminded me that I drunkenly expressed my opinions on the subject by email to the London organising committee. Well it is shocking isn’t it! I encourage you to enjoy the fun on this subject at Jeff’s site. I like to experiment with different ways to present the findings from design research so they are engaging for my clients. I would be interested to get your thoughts on my recent experiment of combining Microsoft’s Product Reaction Cards with tag clouds. For a recent piece of research, I was asked to capture data on the participants emotional response to a proposed redesign, and how that response compared with competitor sites. I showed the participants the homepage of a website and asked them to spend 1 minute having a look at it and considering there first impressions of the page. I asked the participants to tick as many or as few of the words that seemed to resonate with their first impression of the page. I repeated steps 1-3 with a number of other sites. The entire exercise took around 15 minutes – obviously I had a lot of other objectives to cover as well! After completing all of the research sessions, I collated the data in Excel and looked at how many times each word had been ticked. At this stage the data seemed interesting, but completely unengaging. I considered turning the data in simple bar graphs, but decided instead to experience with presenting the data as tag clouds. Also I find presenting qualitative data in the form of quantitative data can make me feel a bit uncomfortable. These enabled my client to quickly get a sense of the most common reactions to each sites. I think this works as a way of presenting this kind of qualitative data, what do you think? 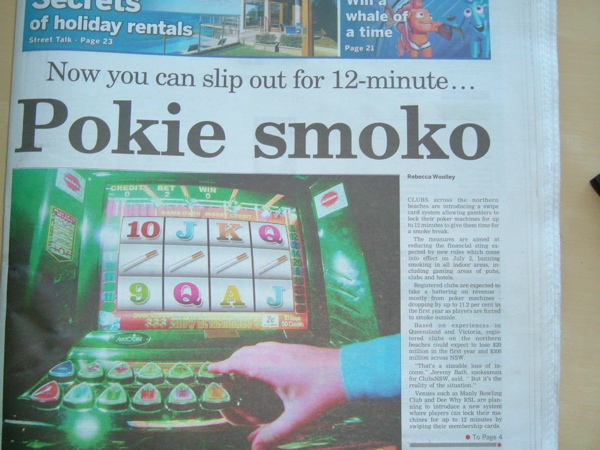 I was amused to see the front page of my local paper, the Manly Daily, had a story about the customisation of pokies (slot machines to most non-Australians). It is all a result of smoking bans in pubs that is coming in to force very soon in NSW. Australian’s love pokies. I read somewhere that 1/10th of the world’s slot machines are in NSW. So the smoking ban could be a big problem. People like putting a lot of money into the machines. A machine becomes lucky/gets hot/pays out big once in a while. Players are reluctant to leave a machine they’ve put quite a bit of money into because they feel the machine is just about to pay out big (!). Many pokie players love to smoke. The solution? Simple. Put a new feature into the machines that enables people to lock them for 12 minutes while they go out for a smoke. If you are so inclined, you can read the full story at the Manly Daily website.